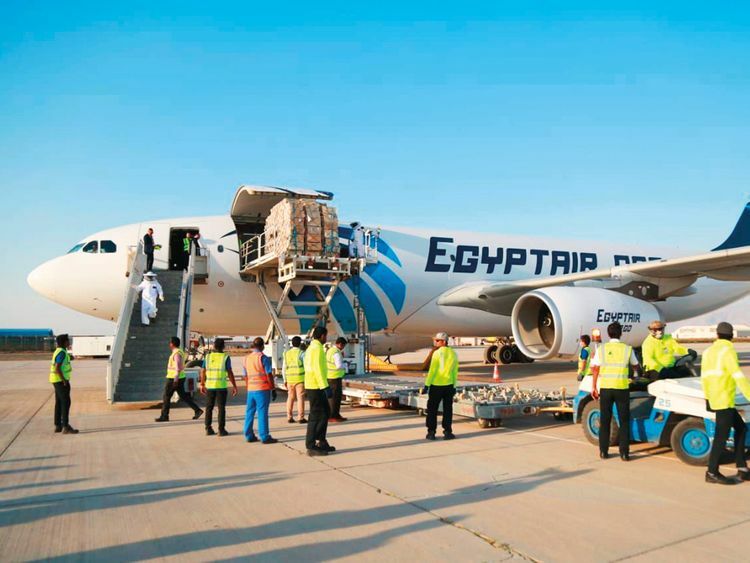 RAS AL KHAIMAH: Forty tons of live honeybees landed at Ras Al Khaimah International Airport on an Egypt Air Cargo flight from Cairo on March 14, even as customers waited to receive them to take them to various farms across the UAE. As the UAE-based Al Najeh Honey Farm entrusted Ras Al Khaimah International Airport (RAK) with the task of ensuring a safe entry for the honeybees, their arrival was a smooth affair with the airport taking all care to deliver the honey bee shipments to their consignees in the shortest possible time. He said he was grateful to Wagih Habeeb, Country Head, Sherif Sabry, General Manager from Egypt Air Cargo and Mohammad Najeh, Chairman of Al Najeh Honey & Bees Trading for providing the airport with the opportunity to carry out the task. Al Najeh Honey farm is located in a remote desert property surrounded by a rickety barbed wire fence. It houses 100 hives, each discreetly hidden in trees in locked plastic chests that are filled with trays of honeycombs and guarded by thousands of bees. Al Najeh Honey owns and operates farms all through Egypt, Saudi Arabia and UAE, mostly in the northern emirates near Al Dhaid.